Given the overwhelming amount of evidence of failures already we’ve no idea why another inspection is required, or what it is truly meant to uncover, but if the Sloves can’t perform for one day, in an (un)announced inspection, surely someone will step in and do something? A month ago now, at the start of March 2016, I decided to have a look at how other NHS mental health trusts had responded to the Mazars report. I checked all the December, January and February Board Papers for all 58 mental health trusts. If Mazars or Southern Health was given even a cursory mention it was included in this analysis. 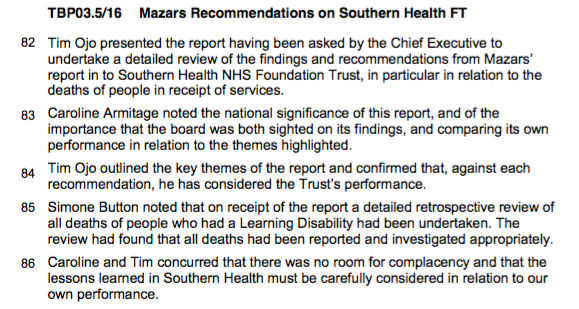 41 out of the 58 Boards made some mention of the Mazars report and Southern Health’s performance. Think it’s probably safe to say that those that didn’t must be in some sort of denial of the importance and relevance, or living in some sub-human slipstream. They were: 5 Boroughs; Avon and Wiltshire; Birmingham & Solihull; Bradford; Calderstones; Cumbria; Devon; Leeds & York; Northumberland Tyne & Wear; North East London; Oxford Health; Rotherham, Doncaster & South Humber; Solent; Somerset; Staffordshire & Stoke on Trent; Tavistock & Portman. Worcestershire Health and Care get a special mention for being impossible to access, despite requesting papers and having the inaccessible version emailed to me. So, what of those who did discuss the Mazars report. In the spirit of brevity [postscript: apologies, this is obviously a relative concept, this is not a short post but it is quicker than reading 41 sets of Board Papers] and knowledge translation, I’ve read all of the papers and picked a few highlights to share with you to save anyone else having to ‘deep dive’ into the murky, stinky revolting pool of spin and obfuscation. 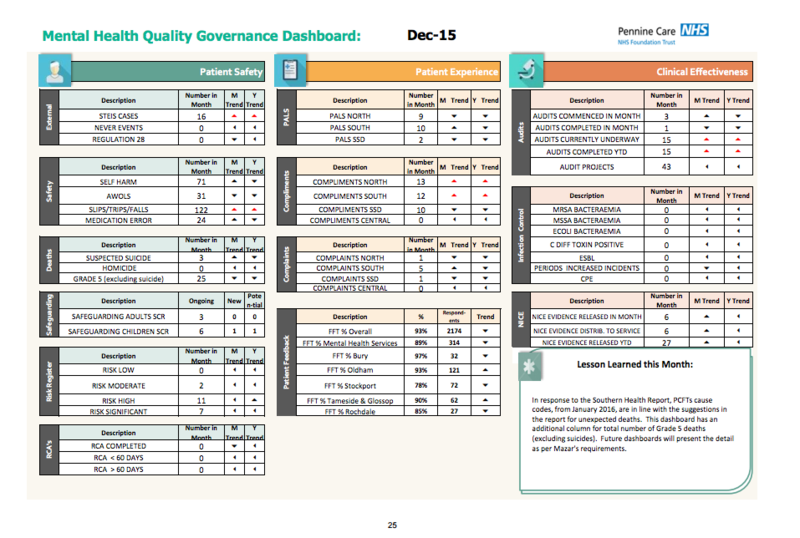 First thing to say was I was pleasantly surprised at the number of Boards and Trusts who appear to have taken the report seriously, and proactively used it to help them learn, reflect and improve their patient care. ‘The Quality and Safety Team therefore reviewed a random sample of 55 cases of patients who died between 1st April 2011 and 31st March 2015 drawn from CAMHS, Adult, Learning Disability and Older Adult Services. Findings evidenced a varying quality of recording at the point of death across the cases. The cases reviewed that met criteria for Serious Incident (SI) investigation were cross checked and all were found to have been escalated for SI investigation. From the sample, and based upon the evidence within the records, no cases from the random sample were identified as having been missed as requiring SI investigation’. LPFT has a comprehensive and systematic approach to learning from deaths…. 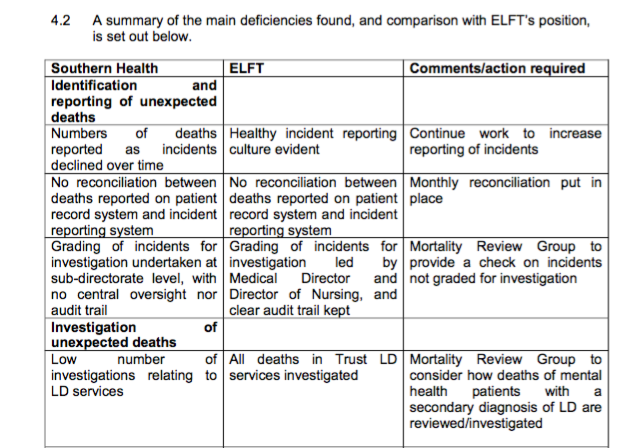 LPFT has an effective system for the management and oversight of the reporting of deaths via Datix reports, which are scrutinised daily by the Quality and Safety Team…. LPFT has Board oversight of serious incidents, receiving a monthly related Board paper. All SI investigations level 1 are reviewed and approved by an Executive Director…. Duty of Candour is evidenced in all Trust SI investigations, with compliance reported quarterly to commissioners within the Trust’s Quality Schedule…. You can see the greater detail in the paper on Lessons Learnt from Southern Health. Lincolnshire’s response is thorough and honest, they are not claiming to have everything right, but they are clear that they are committed to improving their provision and ensuring learning is identified from deaths. There is more detail in the February minutes here. There is a real sense of importance and seriousness, care and attention to the local implications and a reminder not to be complacent. The Board at Nottinghamshire Healthcare have had two detailed discussions of the Mazars report and the implications for them locally at the time the review was conducted. The January paper can be viewed here and the February one here. There was a high level of attrition, from the level of deaths initially recorded on the Trust’s systems to those subsequently reported and investigated. This attrition varied across care groups (for instance, there was a greater likelihood of a Mental Health death which was a suicide being investigated than the death of someone with a Learning Disability due to the interpretation of national guidance). 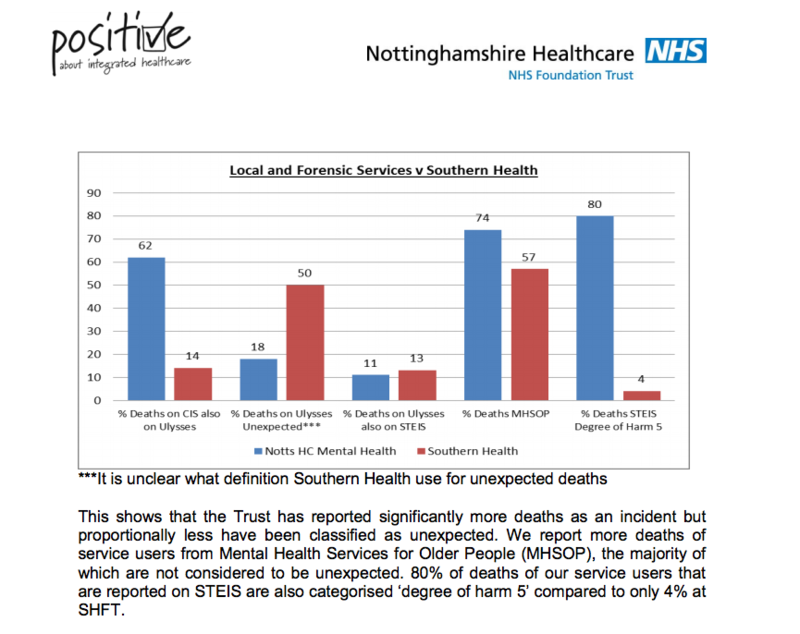 It is also reflected in the fact that the Trust reports a low number of deaths to StEIS under death and suicide categories in comparison with other regional NHS Mental Health provider Trusts and in absolute terms to the National Reporting and Learning System (NRLS) under ‘degree of harm death’. From our review of the evidence, too few deaths were investigated in Learning Disability and Older People Mental Health services. It is therefore reassuring to see other Trusts have healthier reporting practices and lower levels of attrition. There is a lot of information in the paper (all detailed here) suffice to say East London appear to be much more open and interested (and better performing) than Southern Health. The glaringly obvious difference is that all deaths in the Trust’s learning disability services are investigated, as opposed to 1% of deaths at Southern Health. It was crystal clear that not only were processes better elsewhere, the numbers were vastly different. Despite this, just this week Katrina Percy was barefaced lying again on BBC News stating that Southern Health are no worse than anywhere else. It was more important to note actual numbers given the overall pledge to reduce suicides to zero. Southern Health haven’t done anything as aspirational as pledged that they would reduce suicides in their Trust to zero, but the point about the value of comparative data stands. Similar number of deaths reported onto Ulysses and similar number of unexpected deaths, but look at how many more warrant investigation at Pennine Care. Yet further evidence that Katrina Percy’s ‘we are not an outlier’ refrain is growing ever more hollow. I have to say that South West London and St George’s shone like a beacon of hope through this process. The document Summary Report of Trust processes to investigate deaths prepared in December for January Board meeting was exceptionally clear and gave cause for much optimism. They have clear processes, clear governance, they have consistently met the 45 or 60 day time requirement for investigations since December 2012 and they even have a family liaison officer nominated for each death investigated. This is a world away from Southern Health’s treatment of Connor’s family. The proactive approach to investigating and learning also extends to preventing deaths in the first place, compare and contrast their 2014/15 quality report and it’s focus on embedding learning from Francis and Winterbourne View, with the work of fiction reported by Southern Health discussed here. One of the responses to Mazars that I’ve found most infuriating personally, is the definition argument. We’ve repeatedly been told that it’s complicated/complex/not clear cut how deaths are defined. There has been much delay, obfuscation and excuse in relation to what definitions should be used when discussing deaths, indeed some Trusts only mention of Mazars was to say that they were waiting for more information on how deaths were defined. Arrrrrrgh, there are people at risk of dying prematurely while people argue over semantics. Yes, there are subtle, and important, differences between unexpected, preventable and premature death. The Mazars report unpicks this is great detail. Any responsible Trust should know how they themselves are recording, investigating and responding to deaths. The Trust uses the following definition of unexpected death: the death of any patient not on an end of life care pathway. Booooooom. IOW’s brilliantly simple definition for an unexpected death, is likely to really shine a spotlight on the hundreds of people with a learning disability who die prematurely and get squirrelled away in Board minutes as ‘natural causes’. If you die from constipation, or cardiac arrest in your 30s, or choking or indeed a seizure in a bath as an 18 year old, this is likely to be picked up, because having a learning disability does not equate to being on an end of life care pathway. Or it shouldn’t, even if it does in the mindset of too many. Writing this blog post was an unexpected and surprisingly positive experience. That’s not to say all is well, there were a number of Trusts who have some way to go to improve their practice. In addition to those who haven’t discussed Mazars, there were a number of pictures of poor or ambivalent practice captured by Board papers, such as the discussion in the January Mersey Care Board Papers. The Mersey Care mortality review process looks at less than 10% of deaths, and mostly those relating to suicide or falls. Not sure that will pick up much learning for preventing future deaths of people with a learning disability, or those who die due to medication errors for example. Mersey Care did acknowledge that they needed to make some changes and improvements. Considered the report and its findings and recommendations. A review of how we report deaths and a review of all deaths in the last 12 months was presented to the Quality Committee on 14th January 2016 with detailed analysis and recommendations on the Trust procedures and learning from other organisations areas for improvement. Carolyn Green informed the Board that the Quality Committee had scrutinised the report and the Trust has a plan in place that will ensure good governance in this area and purposeful learning. This information has been shared nationally and other authorities have thanked us for this. Strong assurance on duty of candour has been obtained although there are still national reputational issues that need to be addressed as there are difficult interpretations of investigations but Carolyn Green was confident the Trust has a very strong process of control in this area. The emphasis is mine, and I have no reason to believe that Derbyshire aren’t all over their investigations and completely on top of everything, but there was something that didn’t smell very good to me. It could just have been the way in which the meeting was reported, but it was all a little reminiscent of nothing to see here, we’re good, national problems culture elsewhere. Seems that Leeds and York are also grasping at the ‘not an outlier’ argument, not sure that answers Mrs Phipps question or would provide any comfort to the families of those four patients who died from hanging on their watch. The Trust’s approach to incident reporting and investigation differs from the description of incident management described in the Southern Health external audit report. We’ve a long way to go to improve care for people with a learning disability or using mental health services in the UK. The failings detailed in the Mazars report are no doubt not unique to Southern Health, however, it is clear that they are far and above exceptional in their comprehensive failure and performance and their inability to understand that they need to improve. Still. Epic amount of work George and it is immensely cheering that so many are so much better than Southern Health. And reading what they had done felt so concrete, not like wading through the fog of Southern Health minutes. BTW Leeds and York PFT were so bad that York CCG has replaced them with another provider. Also their failure to act to make York”s only psychiatric hospital safe ( including ligature points) meant that the hospital was closed by CQC at a few days notice. Very useful I formation which all mental health trusts need to read, reflect and act on.